The cowboy explains proper technique to his young daughter. The granite pot is beginning to boil on the remains of a branding fire in the corral. 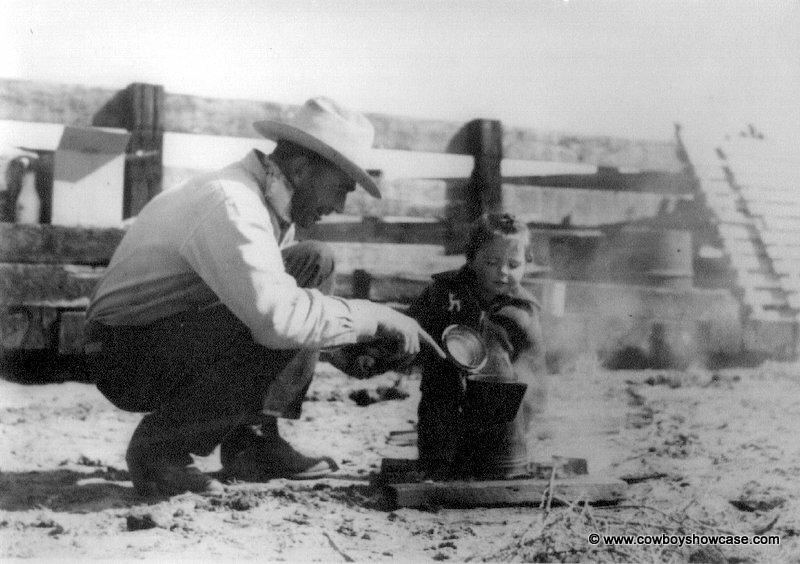 Cowboy coffee has been a staple of cowboy cuisine since the days of the great cattle drives. The mystique of campfire coffee remains strong. Many techniques and recipes are used. Here is mine. I learned how beginning in the photo above. Let us know your favorite. Fill coffee pot with COLD water. Bring the water just to a rolling boil. Take off heat. Add a splash (a couple of tablespoons) of cold water. This is to settle the coffee grounds. Allow the coffee to set for a couple of minutes for the settling to take place. Pour and enjoy a taste of the old west.